Official figures for oil and gas reserves in Cambodia are not available. However, the presence of oil reserves in the country have been revealed by : onshore oil seepages; presence of sedimentary rocks; geological structures that may trap and hold oil and gas; interpretation of regional geology; similarity of geology of areas adjacent to Cambodia within which oil and gas has been found and is being produced east of Angkor Thom. In fact, estimates by the World Bank and United Nation Development Programme indicate that the country may have up to 2 billion barrels of oil and up to 11 trillion cubic feet of gas. Cambodia imports all its petroleum needs and does not have any refinery capacity. Therefore, the Government is keen to have participating interests in petroleum development projects alongside contractors. Such participation will enable the Cambodians to acquire skills in planning and management of exploration and production of petroleum. The Government agency, Cambodian National Petroleum Authority (CNPA) regulates upstream and downstream petroleum activities in the country. The Petroleum Regulations 1991, as amended in 1998 and 1999, is the legal pillar of the industry. The CNPA is authorized by Royal Decree to negotiate, agree, regulate, supervise and monitor petroleum exploration operations through petroleum agreements with petroleum contractors. Chevron is the largest investor in Cambodian offshore oil reserves and has so far poured around 130 million dollars into exploration. Offshore Cambodia is located in the southern part of the Eurasian plate, away from active centre of crustal subduction or sea floor spreading and Tertiary tectonic history heavily influenced by the collision with the Indian plate during Eocene times. The Khmer half graben experienced right lateral trans-tensional movement caused by extrusion of Indochina during Early Oligocene. The basin depocenter reaches depth of about 6000-7000 metres. Thus there is great potential of oil and gas in Cambodia. 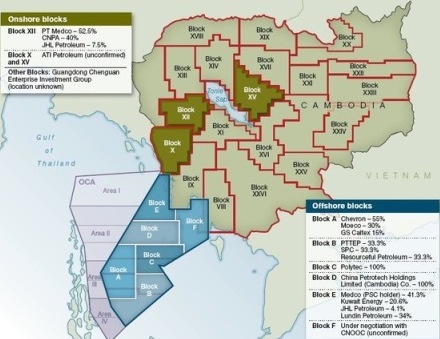 In 2009, Cambodian National Petroleum Authority (CNPA) signed a contract with PetroVietnam Exploration Production Corporation (PVEP) to explore and exploit oil and gas at Block XV in the Tonle Sap Lake area. The initial exploration period is seven years. In 2010, Japan Oil, Gas and Metals National Corp, which is known as JOGMEC, was given right to explore oil and gas in Cambodia. The deal involves upstream activities in Block XVII in Tonle Sap Lake (Great Lake) over a two-year period.